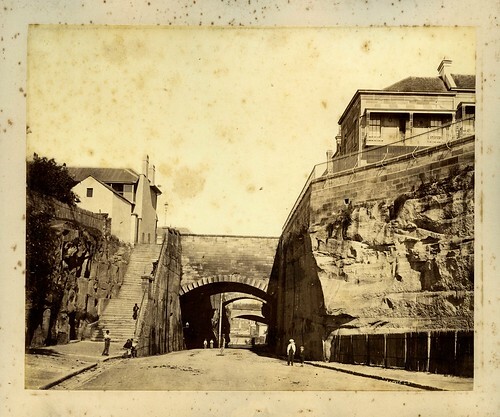 "In 1816, Governor Macquarie floated the idea of cutting a passage through the rock face to join the east and west sides of The Rocks community. As complaints were being voiced both in England and Sydney that Macquarie was wasting precious funds on unnecessary public utilities, Macquarie attempted to raise finance from local business. The only person who showed any interest in the project was fellow Scotsman, James Campbell, the colony’s most successful merchant who operated his business from premises in The Rocks. The program languished until 1843 when convict chain gangs began their assault on the rock face with whatever hand tool could be found. It was completed in 1864. The rubble from the cut was used to construct many of The Rocks’ stone buildings of the era and in the reclamation and construction of the walls of Circular Quay. The Argyle Cut was widened to its present size around the turn of the 20th century. The rubble from the widening was used as landfill around the Darling Harbour foreshore." Format: Albumen photo print, 223mm x 283mm.